"Julie" is our sophisticated, 1965 Rolls-Royce Silver Cloud III. She is dressed to impress in two-tone sterling silver and shell gray paint, and features a dusty blue leather interior. True to her British heritage, this Rolls-Royce is a RIGHT-hand drive car — so you can experience a taste of Europe, stateside! This remarkable, luxurious sedan was handcrafted in England at the height of grand British luxury — boasting 12 square feet of french walnut wood accents, three entire cowhides of leather, and 56 yards of leather piping. This aristocratic automobile even comes equipped with the fold-down “picnic tables” for executives that need to get a little work done on the go. Oh yeah…and this “Roller” has provenance as well! It was previously owned by Hollywood A-lister and Emmy nominated actor, Lloyd Bridges! "Rolls-Royce motor cars are an expression of something I see as quintessentially British; that exhilarating and fertile tension that exists between rebellion and tradition." 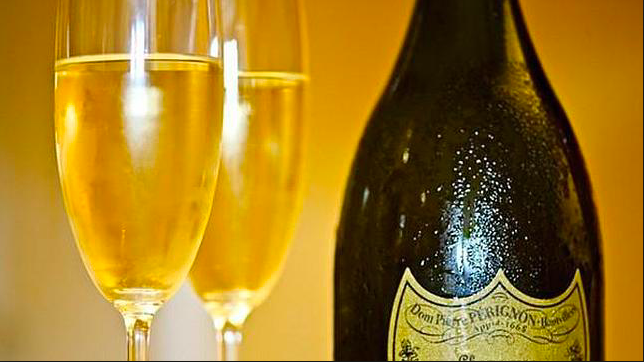 For guests desiring the top-of-the-line experience, we recommend our optional champagne service. Enjoy top-shelf sparkling Taittinger, Dom Perignon or Cristal served in chilled, crystal flutes — all while we transport you across the city and back in time!